Why are there negative values for red? What does it mean? I'd appreciate it if someone could help. And no, this isn't a homework question, it's part of my Computer Graphics course notes, and I'm having trouble understanding this particular concept. Do you mean negative values for blue light? I see no negative values for red light. It looks to me like it is saying that for some wavelengths, the eye actually gets "overwhelmed" and even other colors are "blocked". It's actually red light, whoever made the graph wasn't paying attention. 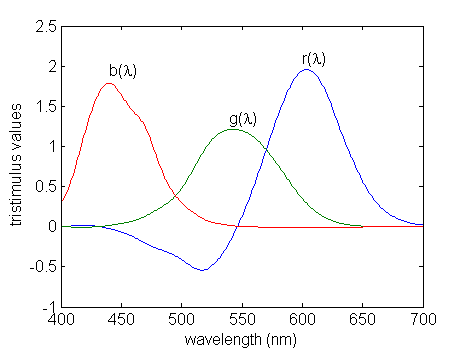 As you can see, the red line is labelled b(x), and the blue one r(x). The labels are correct. After doing some research, I think the negative values mean that in order to replicate the colour at that wavelength, you have to add red to the colour you're trying to replicate.